Ongoing support & consultancy for your internal IT Manager or IT Department. We’re here to support your internal IT expert. Our IT Department provides a comprehensive range of Scheduled Support, Ongoing Consultancy and Project Management services to organisations that already employ the services of an internal IT Expert, or internal IT Department. A quote from one of many happy IT managers that we support. 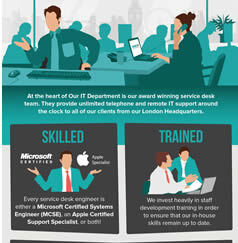 Our IT Department continues to provide IT manager support for our head office in Stratford. It’s great to have peace of mind knowing that any technical issues will be resolved quickly and effectively. Rob Cooke, IT Manager at Showforce. Day-to-day 1st & 2nd line desktop and application support. Our Award Winning service desk team will provide day-to-day telephone and remote support to your staff, liberating your IT Manager from time consuming day-to-day 1st line support, allowing them more time to concentrate on complex issues and applying your medium to long-term IT strategy. Issues that cannot be resolved by the 1st line support teams will be automatically escalated to our internal 2nd and 3rd line remote support engineers. 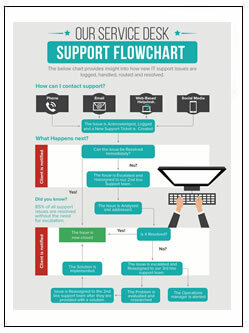 Check out the Infographic below to understand more about how our support process works. 3rd line technical IT Support. With our flexible Ad-hoc 3rd line consultative service, IT Managers will have the option to tap into a highly technical skillset whenever they are faced with a challenging technical issue. Both remote and onsite 3rd line support services are available. Ensure business continuity by introducing on-demand IT staffing solutions to your business. Both you and your IT Manager can relax, knowing that the IT network is in safe hands and any IT issues will be resolved quickly and efficiently by our team. 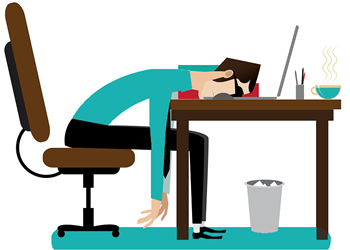 Both Help desk and onsite Field Technician service options are available for mitigating downtime and maintaining productivity during the IT Manager’s absence. IT Project Management and IT Project Rescue. Our team of highly qualified and experienced Project Managers will work closely with your IT Manager, assisting them with ongoing IT Projects, or taking full ownership of the full project lifecycle. If your IT Manager runs into technical difficulties mid-way through a project then our Windows and Apple Server specialists can provide the necessary technical experience required to help you get your project back on schedule. We provide Ad-hoc and ongoing IT Consultancy services to IT Managers. Our Consultancy team will work closely with your IT Manager to implement a clearly defined IT strategy that will help the business achieve its medium and long-term goals. We also provide flexible Ad-hoc Consultative services that give your IT Manager the peace of mind knowing they can speak to a highly experienced and knowledgeable consultant if they need a second opinion, or assistance with a technical issue. A scheduled recurring service that is booked in advanced. An experienced and accredited Field Support Technician will visit your office to assist your IT Manager with any onsite IT tasks that are asked to complete. 24 hour IT Manager support. Our 24/7 London-based help desk provides telephone and remote IT assistance to your staff outside of traditional business working hours. Perfect for clients with subsidiary offices overseas and early starters! Read our latest IT Manager Support case study. Our latest client case study explains how we provide Ongoing IT Manager Support for a UK-based Digital Marketing Agency. Here’s some of our many accreditations. We’re one of only 6 UK-based IT Services organisations that are both ISO9001 and ISO 27001 accredited, demonstrating our commitment to delivering a consistently high standard of customer care and Information security management. We’re a Microsoft Gold certified partner and cloud service specialist, an apple specialist and VMware enterprise partner, in addition to many other accreditations that we currently hold. 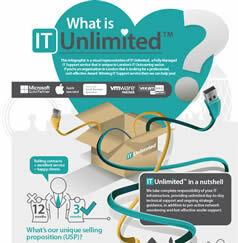 Download a copy of our IT Manager Support Infographic. 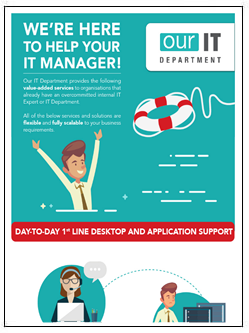 If you’d like a reference document and you find images more engaging than works then click the below thumbnail to download a copy of our IT Manager Support Infographic. 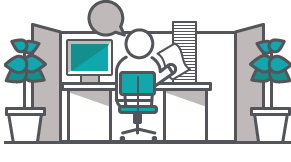 Find our how our IT Manager Support service will add value to your business. Call 020 8501 7676 and find out how we can increase productivity and reduce the pressure that’s being placed on your internal IT function. Alternatively, you can request a callback by completing the online contact form below. COMPLIMENT YOUR IT FUNCTION WITH ADDITIONAL SERVICES AND EXPERTISE.